Brief Synopsis – A teenager about to graduate high school wishes to learn more about her father who was killed in Vietnam and tries to learn more about his life from family and friends. My Take on it – I saw this film on cable years ago and it also stuck in my mind as one of the unsung films about the Vietnam War and it’s vets. 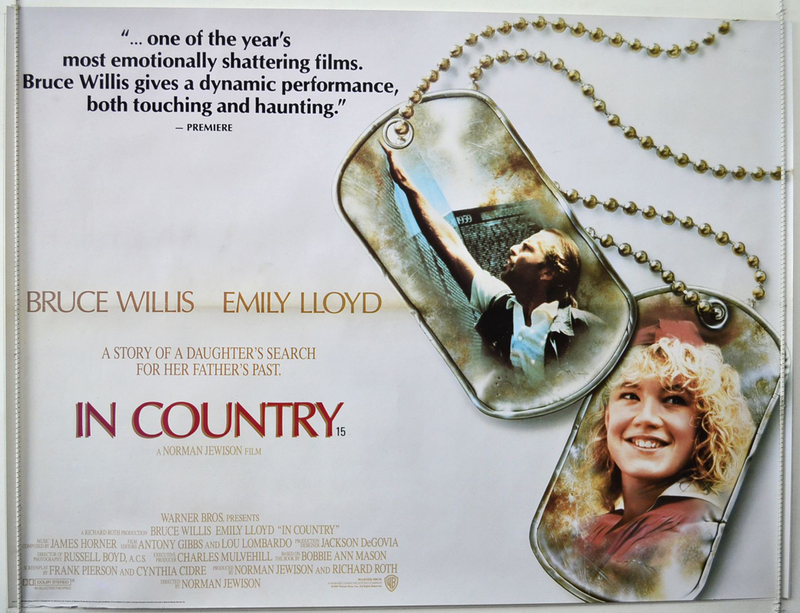 This film shows things from a very interesting perspective and it makes us want to know more and more just like the main character played by Emily Lloyd. She is great here because despite only being 18, her character shows such resolve in trying to find out more about her father’s life before and during the War. As great as Lloyd is here tho, the film is easily stolen by Bruce Willis in every scene he is in. This film came out a year after Die Hard (1988), but Willis is still almost unrecognizable here. The message of the film is quite clear and they do an excellent job showing the way Vets live their lives after a war despite the fact that they are considered unsung heroes and just keep trying to live their normal quite lives despite all that they have gone through. The final scenes are amazingly done and quite emotional for anyone to watch whether you have a connection to Vietnam or not. Bottom Line – Definitely a underrated movie about the Vietnam War that shows things from an interesting perspective. Lloyd is great here, but it’s Willis who steals the show in a nearly unrecognizable role. Great message about how Vets were treated (then and now) and how despite that, they continue to live their quiet lives. Recommended!